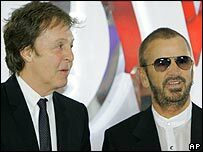 Sir Paul McCartney asked Nasa to "send my love to the aliens"
Across the Universe by the Beatles will become the first song ever to be beamed directly into space next week, US space agency Nasa has announced. The track will be transmitted through the Deep Space Network - a network of antennas - on the 40th anniversary of the song being recorded. It will be aimed at the North Star, Polaris, 431 light-years from Earth. In a message to Nasa, the former Beatle Sir Paul McCartney said the project was an "amazing" feat. "Well done, Nasa," he added. "Send my love to the aliens. All the best, Paul." Meanwhile John Lennon's widow, Yoko Ono, said: "I see this as the beginning of the new age in which we will communicate with billions of planets across the Universe." Fans have been asked to get involved by playing the song at midnight GMT on Monday night, the same time as the space transmission. The event will also mark 50 years of Nasa.